vCard Converter Tool to convert multiple vCard files to CSV and PST file formats. It transfer VCF contacts files into multiple file format on Windows PC in batch. The utility also provides options for merge or split vCard VCF contact files. VCF Converter can move contacts and its fields like name, email address, phone number, company, photos to PST or CSV formats quickly. Vcard Converter tool can support various VCF file from different vCard versions namely, vCard 2.1, vCard 3.0, and vCard 4.0.
from iCloud, GSuite, Skype etc. Using this VCF File Conversion software, one can sorts multiple vCard .vcf contacts in alphabetical, or by size and date order. This option allows a user to search in VCF contact files with ease. After screening vCard file data, the user can transfer VCF files to multiple file formats such as PST and CSV. That is, this software provides an option to convert vCard VCF files to CSV and VCF to PST file format from both single and multiple vCard files. 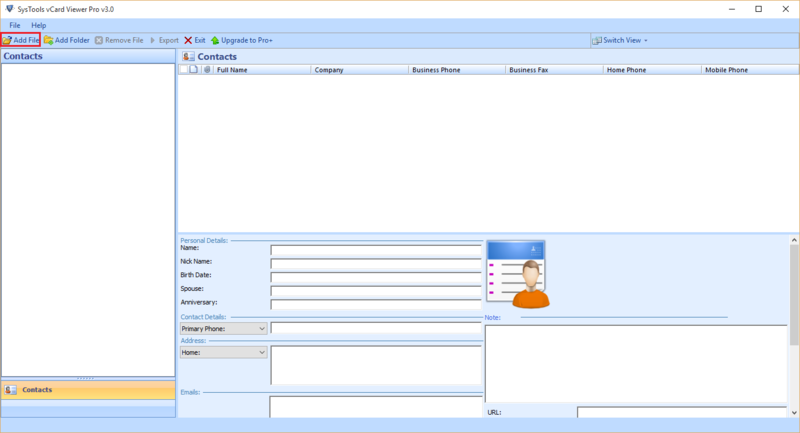 The vCard Converter Tool provides multiple options to migrate vcard contacts. It can work with both vCard file with a single contacts and VCF file with multiple contacts. All the contacts can be move through the Windows Explorer-like interface. VCF File Conversion utility provides the selective migration of contacts in vCard file. It allows a user to select and transfer only the required contacts from VCF file contact list effortlessly. The VCF to CSV migration application provides the option to export only the desired vCard files. It helps to avoid the conversion of the unwanted VCF files from the browsed vCard files list. The vCard Converter Tool provides a provision to split VCF files and VCF contacts selectively as well as in bulk. Also the product can maintain the entire contact information such as name, image, address, email, phone number etc. intact even after split. The VCF Pro Version provides an option to merge VCF contacts or VCF files selectively as well as in batches. This facility is available when the user selects Add Folder option. It also merges VCF contacts from various files collectively to form an individual vCard file. There is an option provided by this utility to sort contact information and arrange it in ascending order. Sort contacts according to size, name or date of creation. All the contacts will be sorted and arranged according to user’s choice. The VCF Conversion wizard works with all versions of VCF file including version 2.1, 3.0 and 4.0. The vCard Converter tool can work with a VCF file from any application and open it for transferring. It does not require any software to be installed on the machine to convert vCard VCF file contacts. The vCard file can be from any email application like Gmail, Lotus Notes, Thunderbird etc. 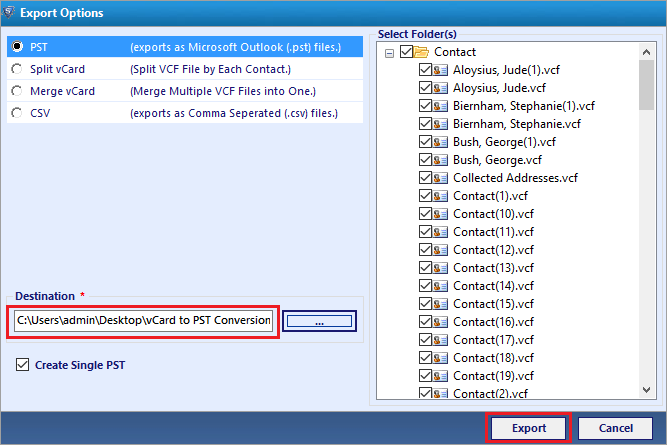 The vCard to PST Conversion utility supports VCF file from all platforms. How To Convert VCF Contacts to PST or CSV Format in Batch? Step 1: Launch VCF to CSV Converter software on your machine and select Add file option. Q. 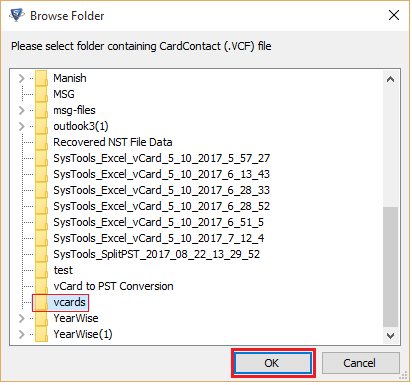 Can this vCard Converter tool migrate multiple vCard contacts into PST format? Ans: Yes, you can transfer vCard ,vcf files to PST format using this application. 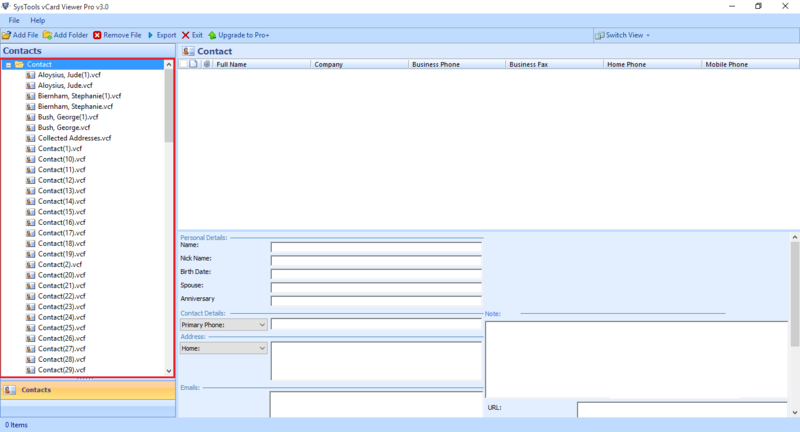 There is a folder option provided by the product to upload multiple vCard contacts to .pst format. Q. Can this VCF Converter wizard can make sure that contact photos are moved? Ans: Yes, this product works with all latest versions of VCF file including version 4.0 that uses photographs as a contact field. All contact photos will be moved to the desired format from a VCF file. Q. Is there a limitation to file size of vCard VCF file that can be transferred by the utility? Ans: No, The vCard pro wizard does not implement any file size limitation on .vcf files while transferring vCard to CSV and PST formats. Q. Does the tool ensures data integrity of all contact information while moving vCard to CSV format? 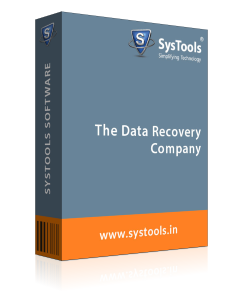 Ans: Yes, the tool ensures that there will be no data loss during migration of VCF files to PST or vCard to CSV file formats. Note: VCF File Conversion Software will get delivered on your registered email id, within few minutes after placing the order. This is an amazing product! I just installed it on my server machine and successfully transferred bulk vCard files to PST format. Our company was waiting on a professional solution like this to migrate vCard .vcf files into PST format. Now, we can move complete address book stored in vCard files into PST or VCF files to CSV using this vCard Converter Tool. I simply enjoyed using this utility. It is very simple software. It can be used even by a non-technical person like me. It is very easy-to-use and have a user friendly interface. There are simple button to add, view and transfer vCard contact information, I highly recommend using VCF File Conversion wizard to all users out there. I have just downloaded and purchased this vCard Converter tool and provided access it to my team. My team loved it! It is a smart technology that can even move the latest vCard information with photographs(v4.0) and old vCard contacts to PST or VCF files to CSV formats. Our team of experts have loved the entire product and will be using it for contact file viewing. It is a smart technology at very reasonable price.